I did it! I finished the list! And it turns out I have quite a lot I can cross off on the 101 in 1001 days challenge. I added lots more travel than I initially anticipated. I think that travelling is important, especially when you have no ties or major responsibilities to hold you back from exploring at your own pace! The travel is mostly in this country due to money and time; I only have 1001 days which sounds ages but along with the saving goals, it doesn't leave much time to save for expensive holidays further afield right now. I've left my blogging goals relatively simple. I love blogging but I don't want to fall into the trap of feeling I have to blog - I much enjoy going along at the pace I have set. I've set realistic goals that still encourage me to push myself without feeling under pressure. I'm shocked at the amount of stuff I want to buy! I never see myself as a materialistic person but I seem to have added lots of possessions and upgrades to my list. I guess its because I want to move out and fill my house with my own personal items and really leave my mark on a place. 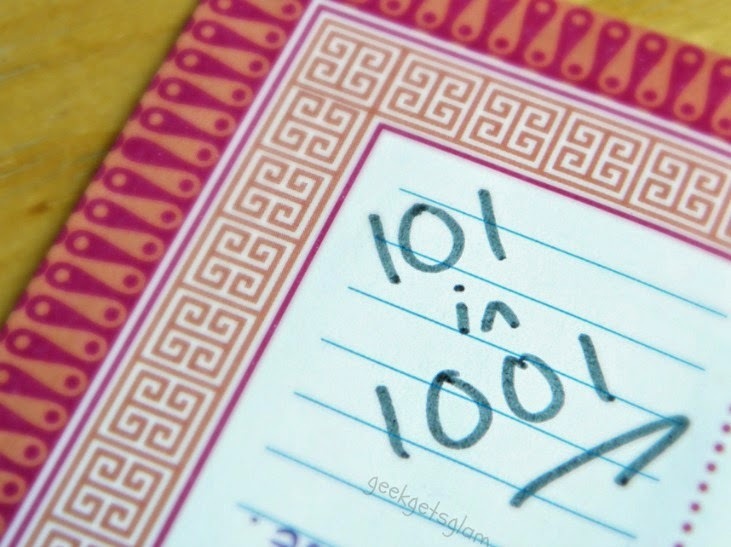 Have you ever tried the 101 in 1001 challenge? Let me know in the comments below!